The First Church Congregational was established in 1730 and the first meetinghouse built in 1731. In 1772, the Congregational parish voted to build a new meetinghouse within the next two years on this current site. It was added to the National Register of Historic Places in 1986 which houses the town clock. 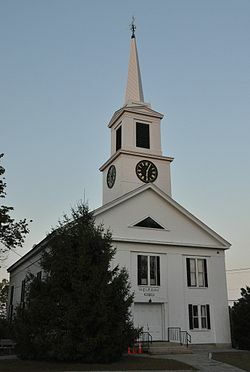 The Chester Congregational Church is significant as well-designed and well preserved major examples of the Greek Revival style in southeastern New Hampshire. The first minister was the Reverend Moses Hale which was succeeded by the Reverend Ebenezer Flagg. The building was set on land given by Rev. Flagg, land he bought from Rev. Hale who had purchased it from Governor Wentworth. There was no heat in the Building until a wood stove was installed in 1821. In 1839, the meetinghouse was totally remodelled. Rev. Flagg died November 14, 1796, at the age of 92 years. The Church bell was broken while tolling for Rev. Flagg’s funeral. A committee was formed in 1803 to purchase a new bell but a year later it was decided to have the old bell recast.